I remember when I heard about the game that sounded like the one reason I would buy a WiiU outside of enjoying Mario and Smash Brothers titles. 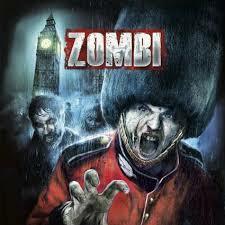 "ZombiU." It sounded like an amazingly fun time, for sure. Utilizing the WiiU Pad as your backpack on a second-screen, navigating a London plagued by Zombies, and the crazy-cool idea of how when your character dies they actually are gone, and you have to go find them as a new person to get your backpack--by destroying the now-zombie former-you. It sounded so fun back in 2012, and when I heard it was coming out on the new consoles finally I was pumped, even though I knew it would a good deal different (after all, we don't have a video-pad for the PS4 or Xbox One). Still, I didn't know I would be so badly disappointed. I think some of the fault for my disliking, "Zombi," as it is now called, may stem from how other games have come along and done better what it did those three-ish years ago. "State of Decay," for the Xbox 360 and the retooled-version of the Xbox One came along and introduced an exciting dynamic of having various characters in a group struggling to survive a zombie apocalypse. This involved scavenging for supplies, and sure enough if one member of your team dies you can no longer play as them, instead having to engage in controlling another member of the camp who goes and kills the newly-zombified other individual to gain their supplies. So, that's one cool dynamic replicated by a different game in an even better way. The game isn't ugly. It just isn't that good-looking either. 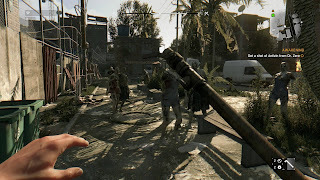 When it comes to exploration, I can point to one game that is amazing fun to climb around and traverse the world of--it is called, "Dying Light," and while it isn't perfect, it has the excitement of exploring an open world down well. Yes, the plot of, "Dying Light," is pretty awful, but in case you were wondering, "Zombi," isn't much better with its story of ancient conspiracies and such coming back into the modern age to wreak havoc. Also, "Zombi," already had so-so graphics back in 2012 so despite some textures getting cleaned-up it ain't like the game is particularly pretty to gawk at (and I am by no means obsessed with good graphics, but they can help ease the sting of a mediocre game). As for the actual combat compared to other games...it's pretty awful. 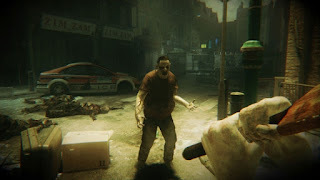 While, "State of Decay," could be annoying to fight in and, "Dying Light," had satisfying melee combat despite the annoyance of weapons easily falling apart, "Zombi,"just feels awkward and unsatisfying when it comes to thwacking characters with a cricket-bat (or other instrument) and shooting a weapon. The combat just lacks the punchy feeling or other games where when you smack someone upside the head it looks and feels like it has some serious impact. "Dying Light," just does it better. With, "it," being basically everything. Perhaps if I had played, "Zombi," back on its original console when it first came out I would have been more impressed, as there are plenty of games I loved when they were new but which haven't aged well. As it is though, "Zombi" for me has just proven to be a massive let-down and twenty bucks wasted considering I got maybe five-dollars worth of entertainment overall. Considering how there are so many zombie-themed games, and a number of those are at least marginally better than this, I would just keep scrolling along when you see this on the digital store for your console. There are simply better ways to spend your money.